When I finally decided to leave my old job – a job I loved and was very comfortable in – my new boss and I wrestled with my new title, eventually landing on Minister of Youth and Family. This role – one that was far more expansive than I’d had in the past – excited me. It also gave me pause. According to Malcolm Gladwell, you need 10,000 hours of deliberate practice to become world-class in any field. I have that in youth ministry. In contrast, I have less than 500 in family ministry, most of which date back to nearly 20 years ago when I ran a Kids Club for a summer missions organization. Upon realizing this, I questioned whether I was crazy to make this transition now. I decided I wasn’t. But I also recognized my knowledge gap. So I began immersing myself in books about children and family ministry. 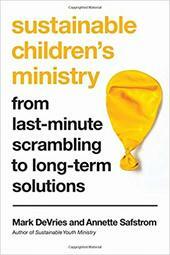 Because I read Sustainable Youth Ministry years ago and found it incredibly helpful, I quickly picked up Sustainable Children’s Ministry: From Last-Minute Scrambling to Long-Term Solutions by Mark DeVries and Annette Safstrom. Sustainable Children’s Ministry is a crash course in effective children’s ministry. It’s highly practical and focuses extensively on the systems needed to implement – as its title suggests – a sustainable children’s ministry. The information in Sustainable Children’s Ministry on recruiting and training leaders is also particularly good. As a ministry veteran, I know the importance of recruiting and training leaders. Yet, having started my role in August, I also feel overwhelmed at recruiting all those I need to partner with. Sustainable Children’s Ministry outlines a volunteer recruitment plan that requires a weekly investment of my time, but makes it feel entirely do-able to staff programs with competent, gifted, and passionate leaders. Although I’m still drastically short of the 10,000 hours needed to be an expert in Children’s Ministry, Sustainable Children’s Ministry left me feeling as though I can last long enough to obtain that status. Sustainable Children’s Ministry is a resource I will return to often during my first few years in my new role as Minister of Youth and Family as I implement the systems needed to do effective ministry. It left me feeling encouraged and motivated and reminded me of what’s most important in ministry. It’s also a resource I’ll gladly pass on to other leaders – both those who are a part of my team as well as those I interact with from other churches. Disclosure: I received a free copy of Sustainable Children's Ministry from InterVarsity Press in exchange for a fair and honest review.